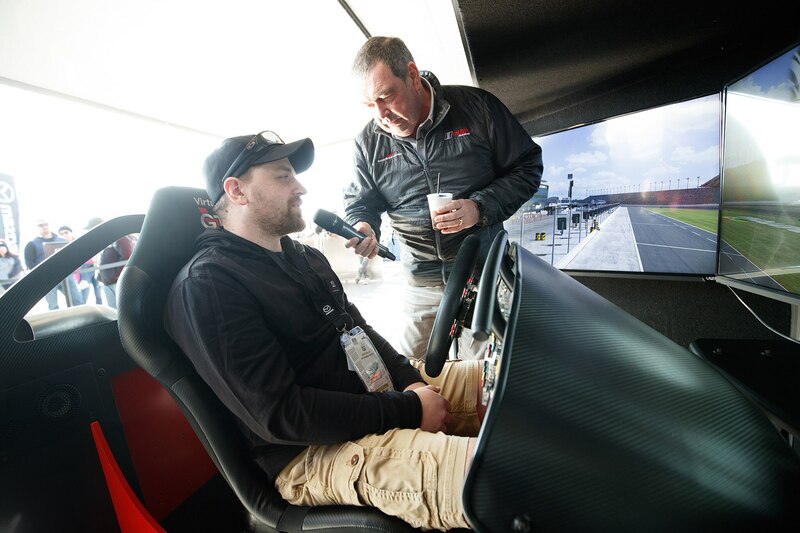 Facing off virtually for a chance to test in a real MX-5 Cup race car. In the midst of 24 hours of fire and fury involving 600-hp Daytona prototypes, thunderous C7.Rs, and shrieking 911 RSRs, two Global MX-5 Cup cars buzzed around Daytona International Raceway’s road course. Despite the steady rush of full-spec prototypes and GT cars, both MX-5s ran unimpeded, clocking in a handful of laps as the voice of Radio Le Mans, John Hindhaugh, gave a turn-by-turn breakdown with his characteristic exuberance. 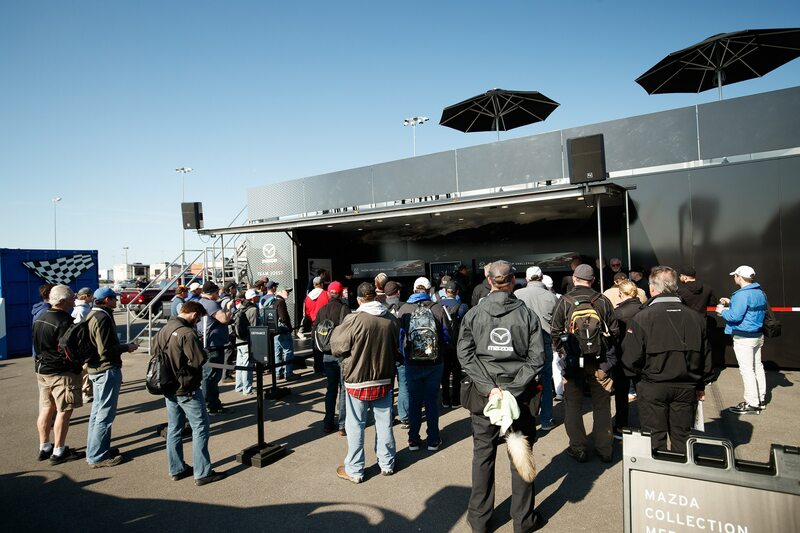 If you weren’t at Mazda’s infield display, you’d be none the wiser these cars were running at all. 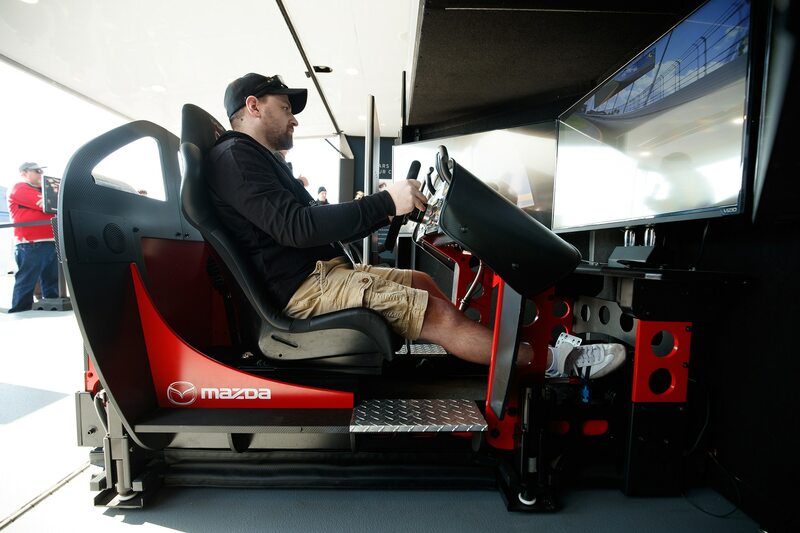 That’s because the Miata competition was the culmination of Mazda’s Hot Lap Challenge, a yearlong tournament held in the digital confines of iRacing, where virtual hot shoes competed for the chance at a test behind the wheel of a real-life Global MX-5 Cup car. 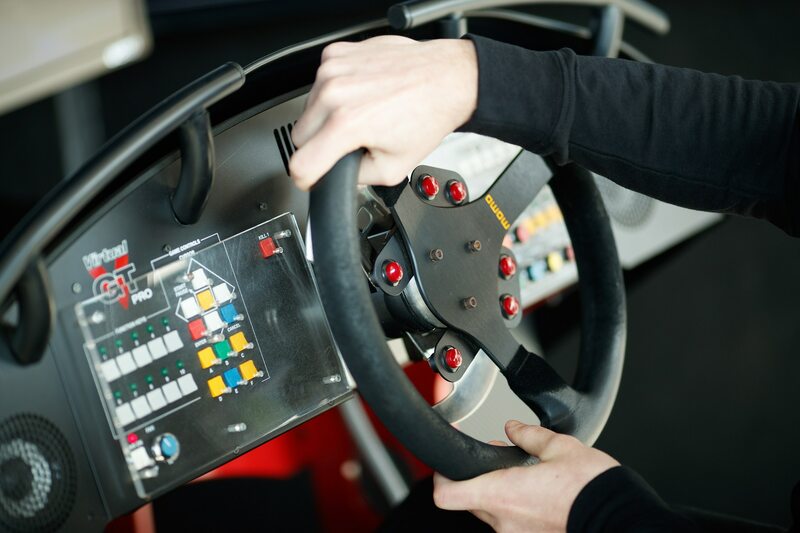 Competitors had two possible paths of entry; the most common way was through the iRacing client, where each driver set a hot lap in the comfort of their own homes. 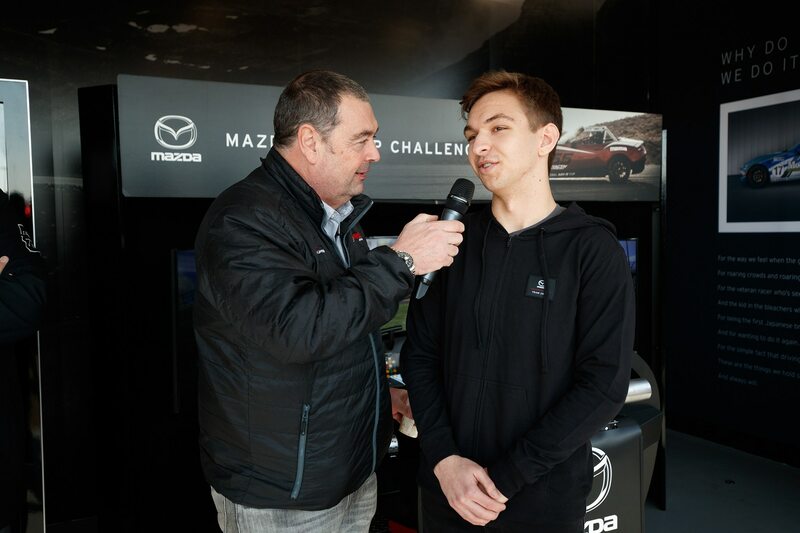 They hoped to place in the top ranks to qualify for the final race, where the fastest times drove side-by-side in a field of MX-5s. Eighteen-year-old Logan Clampitt qualified for the pole in that race back in October of last year, and he stayed among the leading group until he took the win at the end of the 15th and final lap, beating out the second place finisher by an incredible 0.094 second. 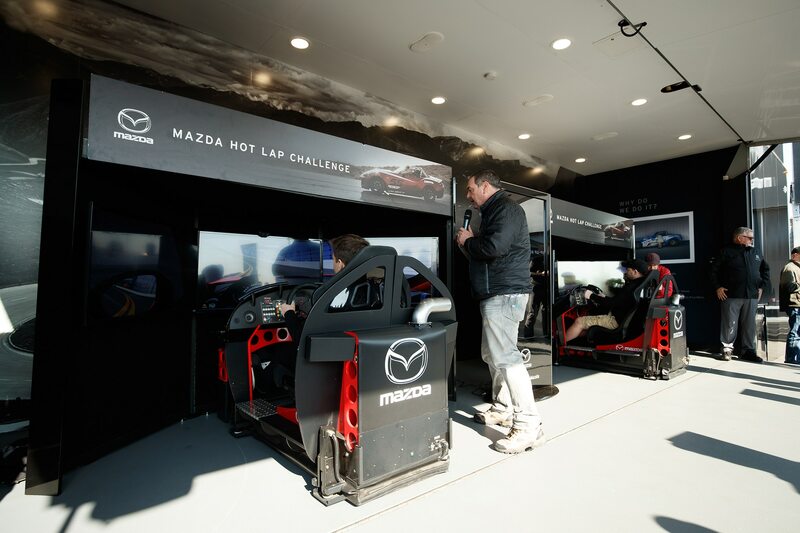 The second qualifier came from Mazda’s iRacing simulator stands that traveled with the team last year to various races. Whoever set the fastest time in the nation got their ride down to Daytona and a chance at the real-world test. I asked each finalist how they prepared for the final head-to-head in Daytona. “I was pretty used to the track and car already, so maybe around once or twice every week,” admitted Clampitt. 34-year-old Mayer didn’t have an iRacing account, so he had no practice or preparation at all outside of his background in track and autocross driving with his race-prepped and completely gutted 1984 Porsche 944. 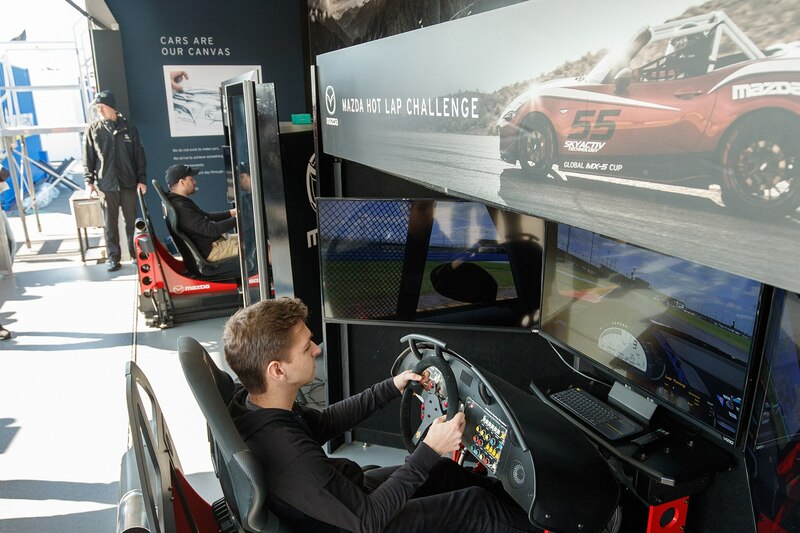 They both met for the first time on Mazda’s display stage, where iRacing set up two racing sims with multiple screens and full seat motion. Each driver drove a Global MX-5 Cup on Daytona’s road circuit for 15 minutes, clocking up as many clean laps as possible before switching seats for another 15-minute session. John Hindhaugh, one of the legends behind Radio Le Mans, announced every success and failure with the same energy he reserves for the real-life thing. The timer starts, and Mazdas scoot off the line, briefly bouncing off the rev limiter on Daytona’s banked oval. Aside from Hindhaugh’s color commentary, there isn’t much to see—the screens are difficult to see from a distance, and the speeds aren’t necessarily impressive. There’s occasional spastic movement from the rig’s hydraulics, but all of that is felt by the drivers, not the bystanders watching in the bright Florida sun. Clampitt was first to set a clean lap, clocking in a 2:16.261 before a spate of “dirty” laps (cut corners, spin-outs, going out of bounds, etc.) stymied his progress. Mayer wasn’t having the easiest go of things, unable to set a single clean lap in the wake of multiple spin-outs that returned him to the pit lane. Eventually, Clampitt took home the win with a 2:14.46, beating out Mayer’s best lap of 2:23 and change. Now Clampitt gets his chance at the real thing. 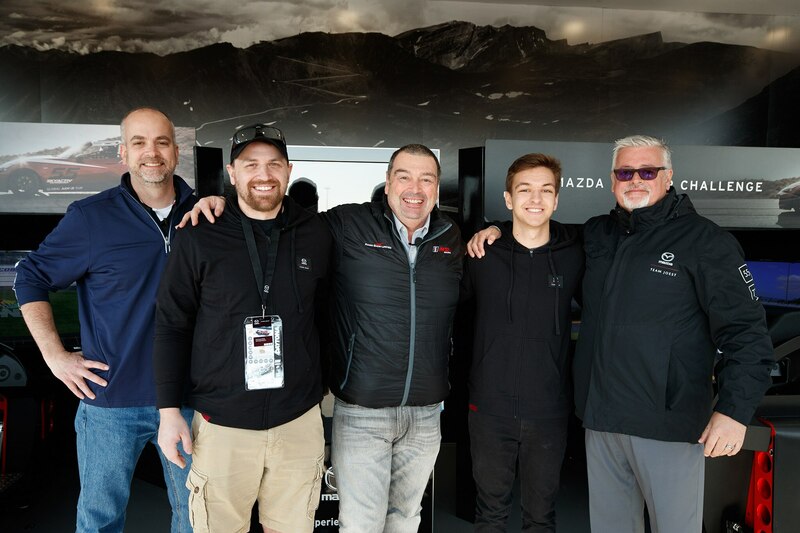 He’s scheduled for a test in a Global MX-5 Cup car at Virginia International Raceway in April, along with instruction from one of Mazda’s Cup drivers.